It seems that wedding season has been replaced by baby season! So many of my friends are expecting and that means baby shower time! 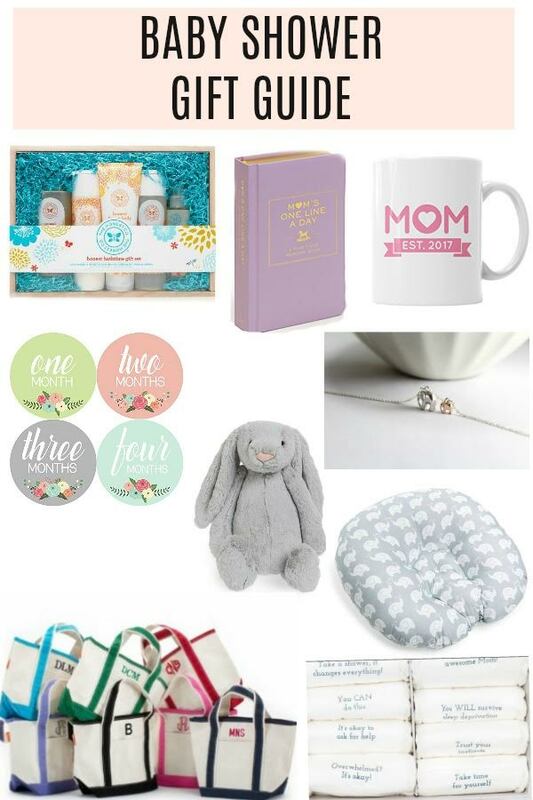 I love sticking to the registry for gifts, but adding a few personal touches along with something fun, different and maybe even a little something for the new mom! Bath Time Gift Set || I love getting this Honest Company Gift Set after the baby is born as a little something else for the new parents. I've purchased it for a few of my girl friends and they all raved about the products and the bonus is the little container it comes in can be used for storage! Months in Motion || Baby Stickers for the baby book or for cute posts to share with friends and family - we bought something similar for my cousin's recent baby shower and I can't wait to see how they look! Believe it or not, my sister used these stickers with my oldest niece (who is about to turn 12!) so these will always be a popular gift! Jellycat Blanket || Something soft and will no doubt be a great addition to the nursery! If you've never picked one of these up, they are so crazy soft you'll want to sleep with one too! Boppy Newborn Lounger || One of my go-to gifts if it's on their registry is the boppy pillow! I know how much my sister used hers with all three of her kids, so I know this is a great gift! Newer to the boppy scene is this newborn lounger that has some stellar reviews!! Coobella Diapers || These cute diapers have little sayings on the front like, "you will survive sleep deprivation" and "Exhausting, but worth it!" and will make changing's a bit more fun - maybe! "New Mom" Coffee Mug || I imagine caffeine will become your new best friend :) One Line a Day Book || First smile, first coo, first bath - I think all of those will be documented via photos, but these one line a day books are awesome as well. I actually bought one that is for married couples for some of our friends and they loved having something to do together every day. Travel Totes || If you know the name or monogram for the new baby a travel tote is great to load up with essentials! The best part is that it's their monogram forever and as they grow up they can continue to use the tote - the gift that keeps on giving!! New Mom Necklace || This is a little hard to see in the collage but, this is two tone necklace that is so delicate and sweet. It's a mama elephant with her baby behind her - even better if their nursery is animal themed! I have a few of these ready to gift to my girlfriends over the next couple of months and I can't wait!! Do you have a favorite baby shower gift? Perfect timing - I was just struggling with what to get my friend! I always like to do a boppy or bumbo or one of those vibrating / moving chairs. Feel like those are always useful gifts! I like giving something personalized too! I've been giving monogrammed totes as gifts for years but never thought of for baby showers...brilliant! Awwwww this is so sweet! Such a great idea for all these personalized touches. These are all such great ideas!!! I love that elephant necklace and clearly need one. Especially since it can double purpose for me during football season!!! The hoppy pillow is a life saver. As is coffee. All the coffee. All of these gifts are so sweet and so thoughtful! That necklace is a great idea and the mug is a must! I love that mom coffee mug! What a cute idea! We were given the Jellycat, bobby lounger and the month stickers and I love them all! It doesn't get much softer than Jellycat! These are all such great ideas, Biana! I love the idea of personal touches, especially for the mom. That necklace is so sweet and I love the coffee mug! It totally does seem like it's baby season!! These are such awesome gift ideas! That bath time gift set is SO adorable and is pretty unique!! We've had three baby showers the past couple of months and have a few more before the end of the year! These are all great ideas - especially love this canvas bags! These are all great ideas, love them. I try and bring a book with every gift, we have a special one with Le Husband's name and it's just a lil something we know will be used forever. These are all such cute ideas - love the totes! I have been doing a cute onesie with the name embroidered on it! It is definitely baby shower season for me- crazy how many people I know are pregnant! I love these personal ideas- it makes the gifts that much sweeter :) My go-to is a monogrammed bib! Love this! The tote is such a great idea. I always stick to a theme for baby gifts with gift baskets so I can do my own thing and include registry items. It's easy to go overboard shopping for all the cute baby stuff! Such cute ideas! Love those totes! it's def baby season. i love anything from the honest company and it's always a good idea to get something for momma bc well, she deserves it! I feel the same way! It seems like everybody is now having babies instead of getting married, and I'm one of them! Those diapers are so cute, and I can only imagine how much more manageable they'd make a late night changing! All of these are so cute! I love everything from the Honest company - I think their gift sets are so cute! A monogramed tote is high up on my to buy soon list - you can fit so much in there! I would have loved any of these, great guide!! I definitely stick to the registry but also like to add something personalized like a bag or blanket. I've been to 2 baby showers this month already! These are all perfect gifts, loving the personalized gifts. Thanks for posting this! I have to baby shower's to attend and I couldn't decide what to get them. Great picks for gifts. So many sweet options-- the new mom necklace is my favorite. So cute! These items are so sweet! I like to stick to the registry but I add a little something personable with it or when I meet the baby. I have 3 ladies in my bible study pregnant right now... so lots of showers ahead. These are great gift ideas, especially Bath time gift set, and a blanket . Aw these are such sweet gifts! I feel the same way in that the weddings are somewhat dying down and now it's been a lot of baby showers to attend. I also like veering away from the registry list to add something extra. I bought similar Baby Month Stickers for my girl friend who's shower is coming up. Seems like most parents these days like using those to document the month to month growth of their baby whether they post it on social media or not. All such great ideas, especially the Honest products!! After having a baby myself and getting so many clothes that were not my style that I had to return, I really try to stick to registry gifts and give things that the couple will actually NEED and use! I agree that I try to add a personal touch though! These are such awesome suggestions! I always go for those belly stickers:) I also love to gift new moms teething necklaces- they're cute jewelry with natural rubber beads that babies can teeth on! These are all great ideas!! Love this diapers and I think the travel tote is always a good idea! I swear by The Honest Company even though my kids are older! Such a great brand! It's so crazy how your newsfeeds go from engagement posts to wedding posts and then baby posts, such an evolution! Love these gift ideas, having friends who are expecting this will definitely come in handy! This really comes in handy because I'm going to a baby shower next week! Totally eyeing on the Bath Time Gift Set! I love the bunny! Baby gifts are always so fun and cute. Omg, girl, how cute are these gift ideas!? I know for sure any mom would love to receive them, I know I would! We're subscribed to The Honest Company and though we haven't used any of the products on our baby yet, we love the quality of service and of course how natural the ingredients are, so they make great gifts! I also love those diapers, how adorable!?!? I love the little sayings on them! Thanks for sharing, beautiful, and I hope you're having a great week so far! You're definitely the best gift giver whatever the occasion! ;) XOXO Miss you doll! Hope to catch up soon! I love those onesie sticks! Such a cute and practical gift I have seen given. Yes to this. I loved our Jellycat dolls, those monthly stickers and that necklace is just beautiful.